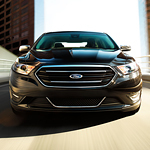 The Ford Taurus is a stylish and sleek full-sized sedan that can take care of any of your driving needs. Ed Koehn Ford of Wayland can explain the differences between the available models and help you choose the right one for you. The Ford Taurus comes with a variety of options for wheels ranging from 17-inch to 20-inch. Wheels also come in different styles and colors so that you can get the right style for you. The small design features are fully integrated from the front of the vehicle to the back. The HID headlamps are bright and bold, and they'll turn on whenever a sensor detects low-light conditions. They'll also be engaged when you use your windshield wipers. The LED taillamps are brighter than normal lights, will illuminate faster, and use less energy. You can trust that you'll be seen from behind.